Following one of our most popular posts Top 10 Coptic Stitch Binding Tutorials on the Internet we have decided to do a post on the top 15 of the best Japanese Stab Binding instructions and tutorials we could find on the web (also known as the Traditional Chinese Binding Method though there are noticeable differences between the two). On this page you’ll also find a collection of video tutorials and many Japanese stab binding related resources. We hope it serves as a good resource for some of you out there. The method of stab binding a paper together has been around since the conception of the book some 2000 years back and was primarily used in China, Japan and other Asian countries. Even today it remains the binding of choice of many Asian countries due to its simplicity, effectiveness and cost. There is also the added benefit of being able to bind the book with ease after the content has been written; this is due to the fact that single sheets are used for the binding and no folding of the paper is required. This is an important factor to consider when choosing an appropriate binding method. In the modern world, Japanese stab binding is perfect for group projects where people submit their own work. No glues are used in the process of making a stab bound book and whilst the traditional method speaks only of using soft materials for the front and back covers the stab bound process does lend itself well to modifications and variations. It is possible to use hard covers with the integration of a flexible cloth hinge near where the book is bound. Good results can be had using this technique but it is a little more complex and perhaps not overly suitable for the beginner. More information on the history of Japanese Stab Binding. A classic 4-hole Japanese binding tutorial by Grace Bonney @ Design Sponge. A good little tutorial of the basic stab binding technique with many photographs documenting the whole process. No special equipment needed. Big thanks to Caroline @ Coloresque for putting together this great tutorial on a hinged Japanese stab binding with stiff cover boards, in this case, made with cardboard. Detailed photographs document the entire process. 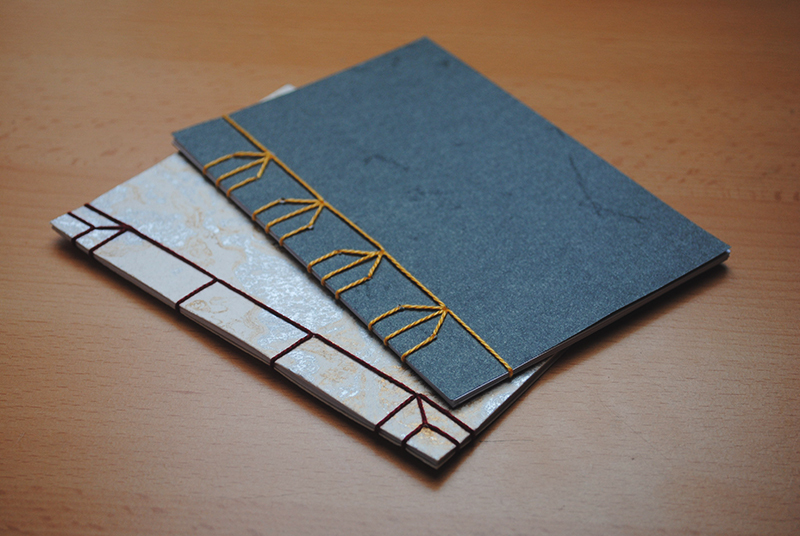 Kris Degraeve has put together a fantastic hinged Japanese Style Stab Bound book tutorial on howdidyoumakethis.com. Using boards, decorative covering paper, clamps and a drill to make beautiful books suitable for any size. Perhaps one of the most comprehensive Japanese Stab Binding tutorials on the internet. Great stuff! A very basic, but excellently documented, Japanese Stab Binding tutorial. Suitable for the beginners out there. This is a soft cover tutorial with a traditional binding (one that you’ll see all over Japan). Has a great intro on how to identify paper grain in your paper before starting. An interesting video tutorial on how to make a Japanese stab bound book from start to finish. The accompanying write up also provides some good information about the usage and suitability of the stab bound book over other binding methods. Get the Equipment You Need to do the Job Properly! If you’re looking to spice up your stitching designs then look no further. On her site, Becca, has put together the most comprehensive collection of different stitching designs with accompanying hole patterns, sewing patterns and written instructions. Probably around 50 stitching patterns to date. An interesting online hemp leaf binding spacing calculator and instructional diagram. Great for beginners and advanced bookbinders alike. A very basic Japanese stab binding tutorial with links to a couple of other tutorials. Suitable for beginners. A great printable PDF document of how to make a hinged Japanese stab bound book by Bley Hack. Another very basic Japanese stab bound bookbinding tutorial suitable for beginners. What about a stab-bound sandwich? Well, if you thought you’d seen it all on the internet, you’re wrong… a tasty tutorial! If you’re in need of some inspiration for your stab binding projects then you might want to check out the ‘pins’ on Pinterest! A hand picked collection of some unique, weird, wacky and beautiful looking books. Some are simply photographs, others are links to other Japanese stab binding tutorials. You can also find our own Pinterest! channel here. View more Tutorials and Photos on Pinterest! View Japanese Stab Binding Videos on Rose Newton’s Site Here. The writers at Lineco have done a fantastic job at creating a printable Japanese stab bound brochure. Hand-drawn diagrams and clear explanations makes this a perfect hand-out at the end of any bookbinding classes. The last resource in our list of best stab binding tutorials. This is a ‘Quick and Messy guide to Japanese Stab Binding’, great for all those looking for all instructions on one page.